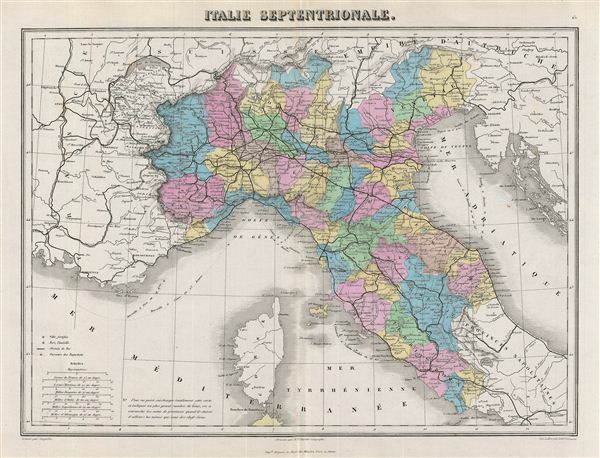 This is a fine example of the Migeon's 1876 map of northern Italy. It covers the northern territories of Tuscany, Modena, Parma, Kingdom of Sardinia, Lombardy, Venice and the State of the Church.Parts of France, Switzerland and Austria are also depicted. Divided and color coded according to province, identifying cities, railways, steamer lines, forts, towns and railroads as well as geological features such as lakes and rivers. This map is issued as plate no. 15. Very good. Original centerfold exhibits wear. Balnk on verso.